N. Idaho St from Monte Diablo Ave to Tilton Ave; El Camino Real from Warren Rd to State St, then down State St and Highland Ave to E Poplar Ave; Cypress Ave from S Bayshore Blvd to S Norfolk St.
El Camino Relief: Enlarge 253 feet of 12-inch pipe to 15-inch pipe. 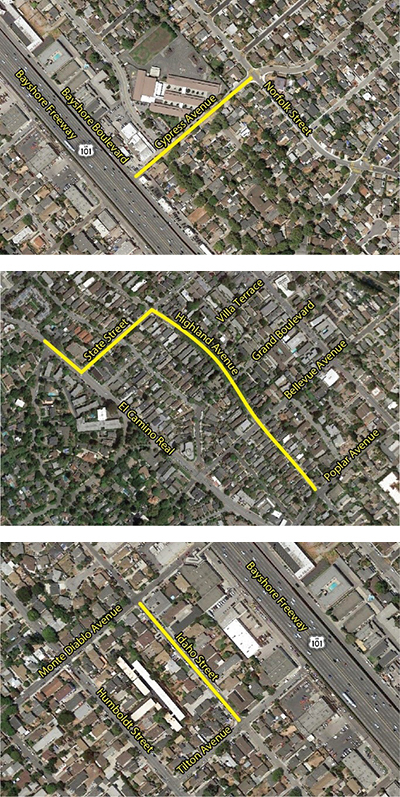 El Camino Real/Poplar Relief: Install 2,579 feet of new 15-inch diversion pipe. N. Idaho Street Relief: Enlarge 660 feet of 15-inch pipe to 24-inch pipe. Cypress Avenue Relief: Enlarge 826 feet of 10-inch pipe to 18-inch pipe. Caltrans permit; National Pollutant Discharge Elimination System permit; Bay Area Air Quality Management District permit.